Once a rarity at weddings, groom’s cakes have gained such popularity that now, it’s rare to go to a wedding that doesn’t feature this alternative to the main wedding cake. The tradition of groom’s cakes in the United States has its roots in the South. Normally, a groom’s cake is a gift from bride to groom, and acts as a foil to the often feminine, traditional wedding cake. 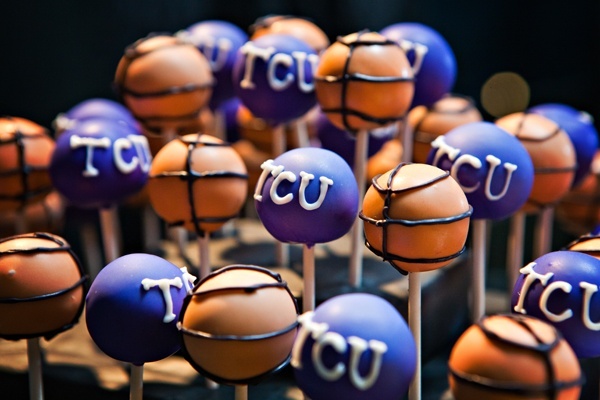 Normally, groom’s cakes do not feature anything flowery or feminine, and often take the shape of something with significance to the groom – a mascot for a favorite sports team, a college logo, a favorite hobby or beverage. Likewise, the flavors of the groom’s cake will typically contrast with the wedding cake, and will often be something “dark,” such as chocolate or a liquor-soaked cake of some sort. Another popular option for a groom’s cake is a cheesecake, which typically does not lend itself well to being stacked in multiple tiers (although it can – and is – done.) 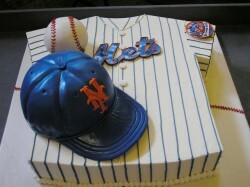 Groom’s cakes are usually served on a separate table from the wedding cake, and may sometimes even be served at the rehearsal dinner the night before. Want to represent your groom in some meaningful and whimsical way to your wedding guests? 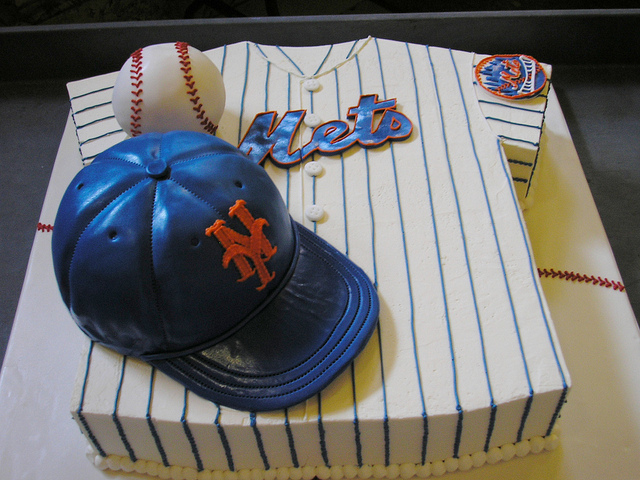 A groom’s cake may be just the thing. This is my first Halloween-inspired post, but it probably won’t be the last. Cutes! 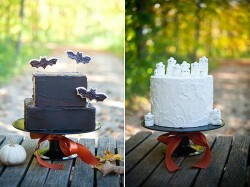 A Wedding Cake Halloween Costume! Did your guy play with Legos as a kid? Does he still? This, Gentle Readers, is not a cake that looks like a meat loaf. 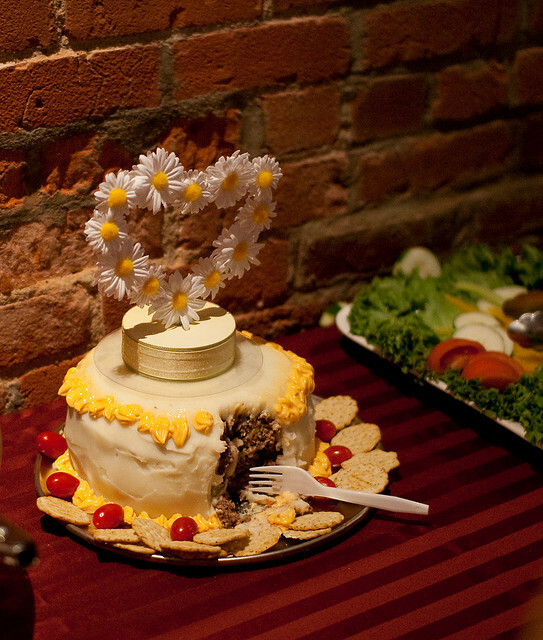 This is, in fact, a cake made of meat loaf. Well, someone took Todd very seriously, and this delightful (and reportedly delicious) meatloaf cake was born. Oh, how I love chocolate. And how I love pirates (well. Johnny Depp and Orlando Bloom, anyway.) 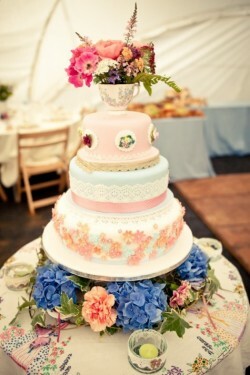 So this cake is pretty dreamy, don't you think? Is your guy inked? Are you? Well, then I’ve found your cake. You’re welcome. 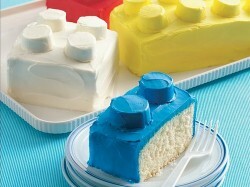 Isn’t this cake fab? The tattoo designs are so retro awesome that I couldn’t resist. 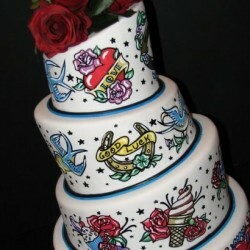 And the motifs are darling, from “Love” to “Luck.” And extra points for ice cream and cupcake tattoos! The topsy-turvy asymmetrical layers are so fun, with red, red roses topping the whole thing in a nod to tradition. 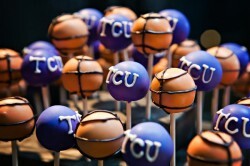 And the hand-drawn designs on fondant are incredible. We don’t know who made this lovely cake, but if you do, we’d love to hear! We found it on Pinterest. And even though you’d never want to copy a cake exactly, this is a great cake for taking a stellar concept and making it your own. Love the idea of a tattoo wedding cake? See this one we featured earlier this year. 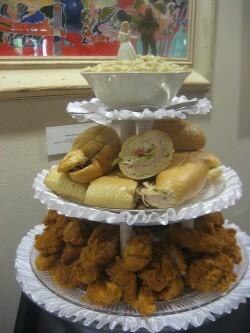 So many times, I see groom’s cakes, and I think, that groom had NOTHING to do with picking out this cake. But this one has the mark of GUY all over it. Thinking out of the box for the guys, aren’t these darling? I have a question for you: why, oh why, does it take going back to school for kiddoes to make life suddenly make sense and seem orderly again? I think that’s hitting the nail on the head. It’s a sense of order. A sense of order that my household has been sorely lacking since the Great Homeschool Experiment of ’11. Homeschooling parents? God bless ’em. We found out that a) this career girl may not be cut out for that kinda thing; b) my daughter may not be, either. So maybe we’ll revisit in a few years. Or maybe not. You don’t know until you try it, and for now, we’re gonna throw the towel in. I have beer on the brain. 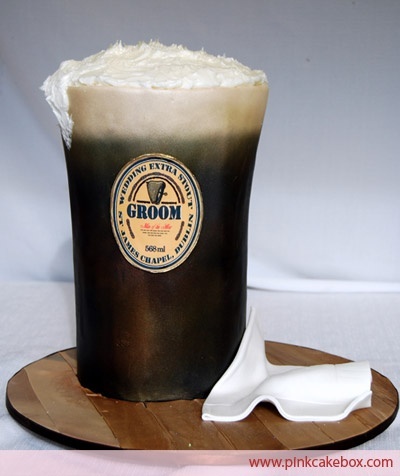 I’m not sure whether it’s the two days straight that I’ve opted for meals in pubs, or if it’s the fact that I just spent an awesome week with a beer loving friend, but I knew it was time to feature that king of groom’s cakes: The Beer Cake. But isn’t this cool? If I’m gonna drink beer, it’s gonna be a good one, and this replica of a pint of Guiness Extra Stout, with lots of cute changes made to the label to make it an original statement, is just awesome, and celebrates right where I am today. I don’t know if it makes me crave cake or beer, though. Either way, it’s good. 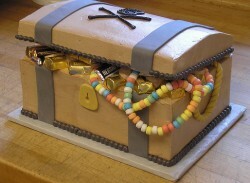 We found this fantastic cake on Pinterest, but if you’re after the look, it was created by the team at Pink Cake Box. We are huge fans of their meticulous work.